Ross & Cromarty Roots | John & Euphemia (Macfarlane) Mackerchar. John & Euphemia (Macfarlane) Mackerchar. In loving memory/of/the Reverend/JOHN MACKERCHAR/Minister of the Free Church/Avoch/born at Rhuvu[g? 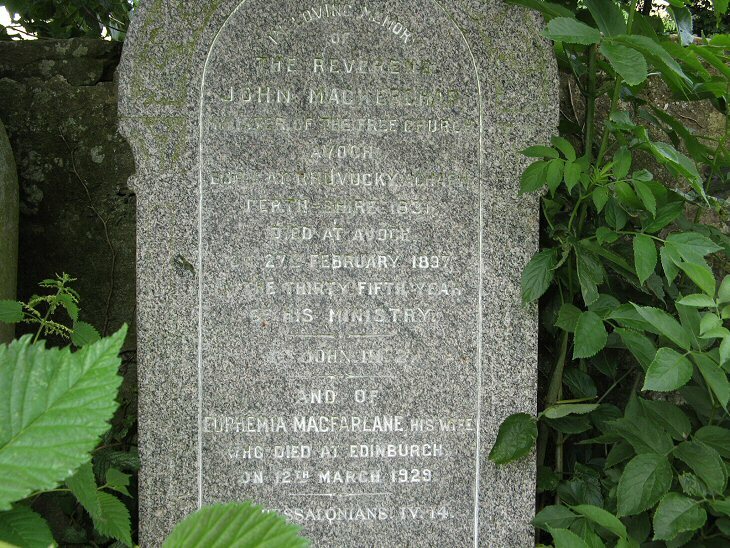 ]ky, Acharn/Perthshire 1831/died at Avoch/27th February 1897/in the thirty fifth year/of his ministry/1st John III.2/and of/EUPHEMIA MACFARLANE his wife/who died at Edinburgh/on 12th March 1929/1st Thessalonians IV 14. Picture Added on 18 December 2007.